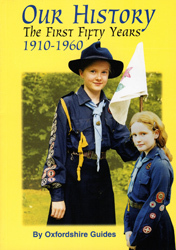 This book traces the history of the Girl Guides in the county from the earliest days, it is also a fascinating slice of social history. The book tells of the camps, activities, service and achievements of a movement that is still very much alive. Using the enthusiasm which shines through the memories, the author has captured the atmosphere of bygone days and the reader will live with these Guides through their camps and hikes, their good turns and sustained service. Above all there is a feeling of fun, friendship and shared experience. Did you know that the Guides made a tremendous practical contribution to the refugee crisis after the Second World War or that the Guides regularly helped the families of out of work miners in Wales? Can you imagine a gamekeeper tying a middle aged lady to a tree while he went to ask the Duke if she really had permission to practise tracking and stalking on the estate? How about the early Guides who used sugar and water and a hot flat-iron to stiffen the brims of their hats and the Trefoil Guild which arranged to lend their children to Guides practising for Child Nurse badges? We join Guides and Brownies watching spellbound as Father Christmas descends the chimney with a sack of presents. We hear of the two adult Guides cooking sausages over an open fire the evening before attending a Buckingham Palace garden party – it took them hours to get the smell of wood smoke from their hair.